I popped by Nameberry last week as part of my weekly (and sometimes daily) ritual. Shock. 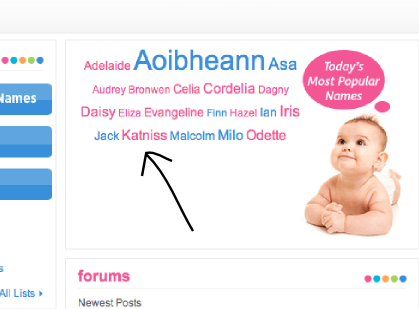 For the first time in a very, very long time neither Seraphina nor Katniss were listed in "Today's Most Popular Names". What? WHAT?!! For the better half of 2011 both Seraphina and Katniss were listed every single day, all day long, without fail. But on February 8, 2012 at approximately 2:54 p.m., neither were listed. Had the queens been dethroned? Well, not quite. I went back to Nameberry over the weekend and there she was, Katniss, not giving up so quickly. Seraphina, however, was still missing. 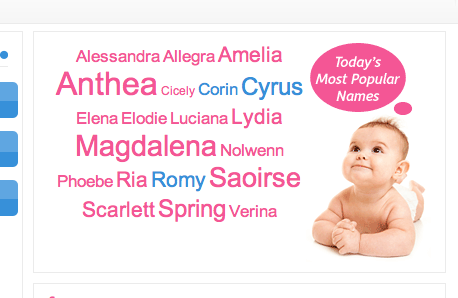 Here is what the "Today's Most Popular Names" section of Nameberry looked like for most of 2011. This screenshot is from a post I wrote in the beginning of November 2011 (here). 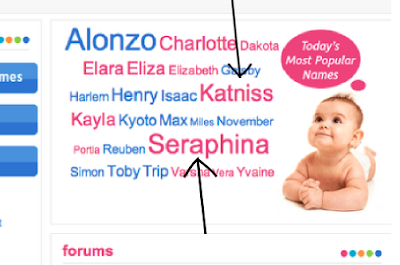 Notice the prominence of both Katniss and Seraphina. The size of each name indicates how many people are searching it (bigger size = more people), pink is for girl names and blue is for boy names (if that wasn't obvious). Here is what the "Today's Most Popular Names" looked like this past weekend. Small Katniss, NO Seraphina. BUT WAIT, this is what it looked like just a couple hours later. 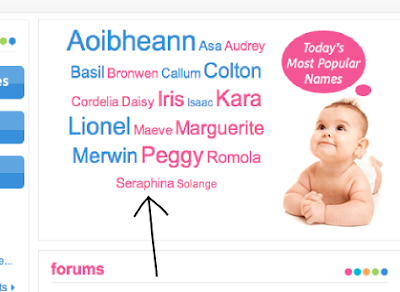 NO Katniss, small Seraphina. Why was I stalking Nameberry this past weekend and why am I giving you the play by play? I want a record. I want visual proof that the times, they are a changin'. This is clear indicator that the next wave of baby name trends is almost upon us. I'm guessing there will be a resurgence of Katniss when the first Hunger Games movie comes out in a little over a month, but the "it" factor is no longer. So what are the new "it" names? I spent a great deal of 2011 predicting what they would be (here, here and here). Now that it's 2012, we don't have to guess anymore. There are proof points all around us. Unfortunately, the only thing proven by Namberry this weekend is that Seraphina and Katniss are on the way out, I didn't see any clear names or trends that are on the way in. The three babies born into my (extended) circle of friends since the new year are a baby boy named Luc, a baby girl named Peyton and a baby girl named Penelope. Not enough material to show a trend. The only trend I spot is amongst the girls: the middle names Lue, Lee and Lou are nearly identical. Hmmm. It's a kickback to the 1920s/1930s South? What names and names trends are you noticing? What have the babies in your life been named? What names are your pregnant friends pondering? PS - Happy Valentine's Day! Here's to hoping you find yourself in the presence of dark chocolate and champagne by the day's end. We've got a new baby Peyton in my family. Other new little babies in my world are Lauren, Karlie, Mason, Anders and Julian. Not a bad bunch of names! I hope the Hunger Games names go far, far away. They are too strange for my tastes. Katniss? Really?? Too close to Katpiss...No??? Wow, weird... my comment is gone but email shows! Strange. I made some snarky remarks echoing the cat piss sentiment, and mentioned Micah as a name I've seen suddenly become popular.